Pears are an excellent source of fibre and a good source of vitamin C for only 100 calories per serving. They are sodium, fat and cholesterol free. The major varieties grown in Ontario are Bartlett (the overwhelming favorite), Clapp's Favourite, Bosc and Flemish Beauty. 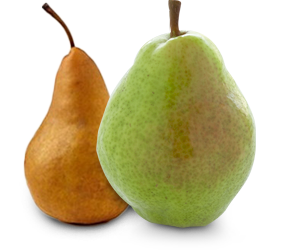 Bartlett, the most common pear world-wide, is bell-shaped, sweet and soft with a light green skin that turns yellow when ripe. It has long been prized for canning and has a buttery texture and mild, sweet flavour. Clapp's Favourite is similar to the Bartlett in shape, with white flesh and exceptional sweetness. Its skin turns golden yellow when ripe. Bosc has an elegant elongated shape with a slender neck and is still relatively crunchy when ripe. An unripe Bosc has brown skin that changes to a golden russet colour as it ripens. It's flesh is yellow and buttery, sweet, and juicy, making it best enjoyed eaten fresh. Flemish Beauty is roundish, with thick clear yellow skin speckled with red when ripe. The creamy colored flesh becomes meltingly tender when ripe.